Care4u Family Conference has Lots to Offer! Get Your Team Together for Trivia Challenge! In this issue, we look at providing end of life care when death is likely to occur in the next few days. 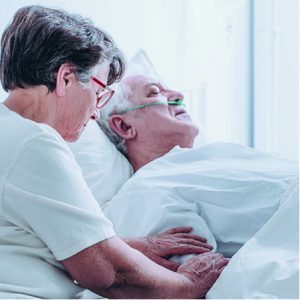 “The goal of care at the end of life is to keep the person as comfortable and pain-free as possible,” says Beth Helliar, Client Support Coordinator at the Alzheimer Society of Manitoba. Beth, who has experience in palliative care, explains that this is the case regardless of whether or not the person has dementia. But if they do, there may be a few more challenges because the person might not be able to use words to communicate. Think back to what was happening with the person in the past. Did they have arthritis pain? Headaches? An upset stomach? If so, one could assume that they may be experiencing these symptoms now and provide appropriate treatment. Beth explains that, when someone is near the end of life, they may not accept offers of food or fluids. The reason for this is that the body doesn’t need nutrition and it can’t process any form of nourishment, whether it be given by mouth or via tube feeding. With that reality in mind, if a person in their last days is choosing not to eat, Beth advises that the kindest thing you can do is to let that be their decision. If they do ask for food, remember that the ability to swallow may be compromised, and they could choke. The best way to respond is to sit the person up and give them a sip of water or a small spoonful of soft food. Often, this little bit of nourishment is all that’s wanted. Another thing to consider is that the person may be experiencing the unpleasant sensation of dry mouth, which often occurs when the body is shutting down. Moistening the person’s mouth with a damp swab, ice chips or very small sips of water (if tolerated) will help. What If Signs of Distress Persist? If signs of distress persist even after anticipating and addressing possible causes, it could be that the person is experiencing delirium, which is common in the last days of life. Medication can be given to help the person feel calm. Samantha Holland cherishes childhood memories of the time she spent with her grandparents, Emil and Lorraine Hedman, at their cottage in Kenora. Her grandfather was a funny, boisterous man who was always working with his hands and fixing things. As she looks back on that time now, Samantha realizes that her grandfather had a tendency to repeat stories, but at the time, she didn’t think much of it. Things changed, though, after he had a heart attack. That’s when Samantha noticed that he couldn’t comprehend conversations, and he began to mumble rather than speak in his usual animated way. “I was only 11 years old. 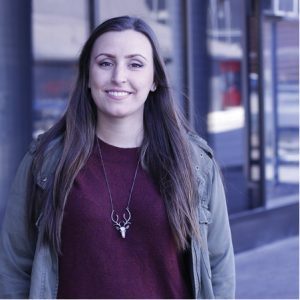 I felt like I was losing my grandpa, and I didn’t understand why,” says Samantha, now 23 and a social work practicum student at the Alzheimer Society. After the heart attack, Emil and Lorraine made the decision to move to an apartment in Winnipeg. Soon afterwards, the family discovered through an assessment that her grandfather had vascular dementia. For Samantha, it was a sad time. She cried a lot because somehow she was aware that the part of her grandfather she knew so well was gone. Samantha doesn’t blame her parents for sheltering her and her sister, Megan, from the truth of what was happening to her grandfather. She knows that at the time, neither her parents nor her grandparents had adequate support and information about dementia; they didn’t have a knowledge base from which to teach their children. Samantha’s experience demonstrates the need to educate young people about dementia. 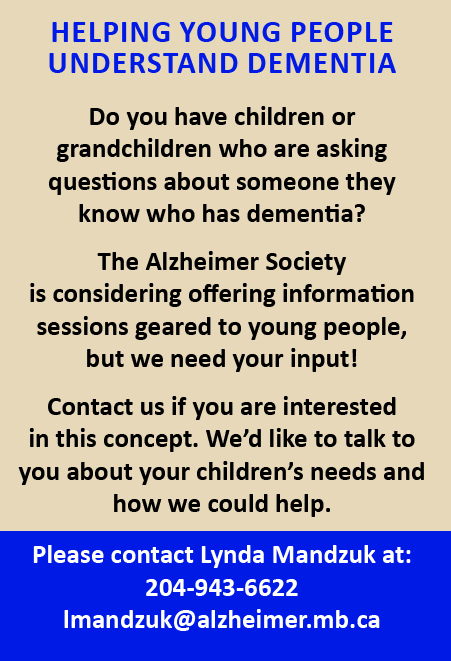 The Alzheimer Society is currently considering offering information sessions that would provide age appropriate material about dementia and how it affects people. A study conducted by researchers from the University of Canberra, Australia, examined the effects of supervised exercise interventions on cognitive function. The study design included a search and review of previously completed studies. Studies selected for consideration had to be randomized control trials examining the habits of community dwelling men or women, aged 50 years or older, who were engaged in structured exercise programs where cognitive function was measured. Seventy–five studies met the research criteria. Exercise interventions reviewed were: aerobic exercise, resistance training, multi-component training, tai chi and yoga. The review showed that physical exercise interventions are effective in improving the cognitive function in adults over 50 years of age regardless of baseline cognitive status. Results also suggested that exercise interventions with both aerobic and resistance training that are at least 45 minutes, of moderate to vigorous intensity and engage people on numerous days of the week are beneficial to cognitive function. The results of this study validate previous studies showing the benefits of physical exercise on cognitive function. 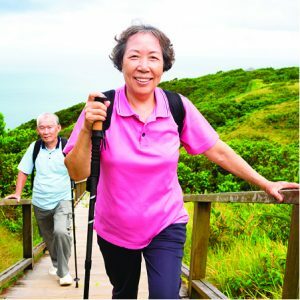 The study outcomes are consistent with Canada’s physical activity guideline for older adults, which notes that engaging in structured exercise multiple times per week has both functional and cognitive benefits. Gather friends, family and co-workers for a fun night of trivia! Teams of 10 compete in 10 fast-paced rounds of brain bending trivia for the title of Grand Champion – all in support of the Alzheimer Society! Care4u Family Conference – Register Now!